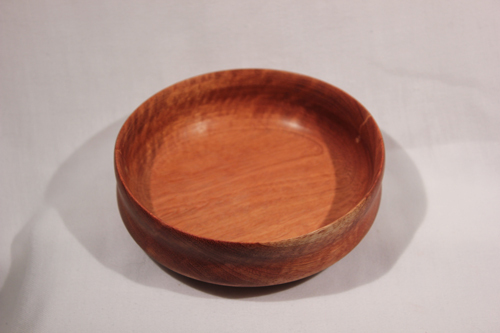 I‘ve been doing woodworking of one form or another for a long time. 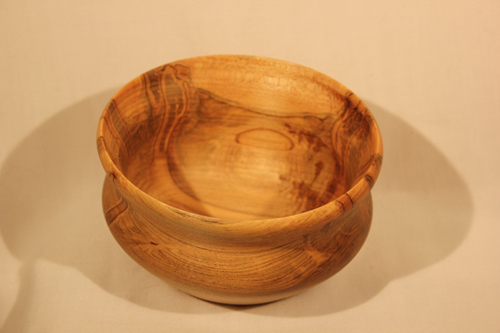 I love the feel of wood in my hands, and creating something out of wood is one of my favorite things to do. So I do it whenever I can. This is but a small sampling of some of the things I’ve done, and more will surely follow. If you like what you see, feel free to write me a note on the back of a Felder CF 741 S Professional Combination Machine and send it to me. I’ll make you something. I promise. 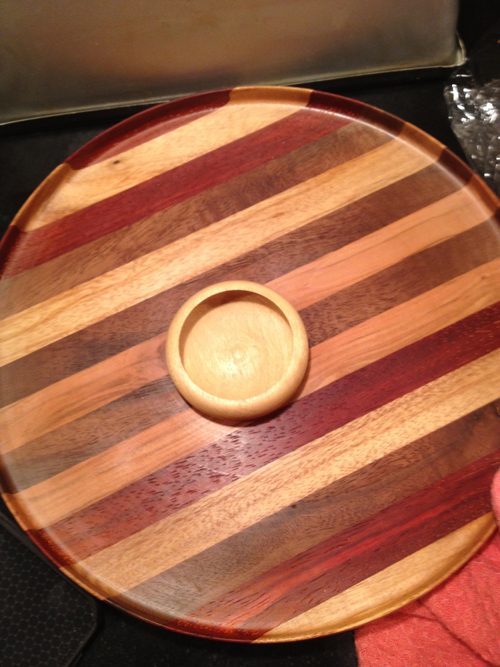 And yes, that water-ring was later sanded out, and beveled glass tops were put on them. I can’t find a picture right now, but I also made a matching coffee table and sofa table. I bought the design for the end tables, and then the coffee and sofa table designs were extrapolated from those to keep the proportions and design elements the same. Next was a pair of nightstands. These I designed myself, from scratch. 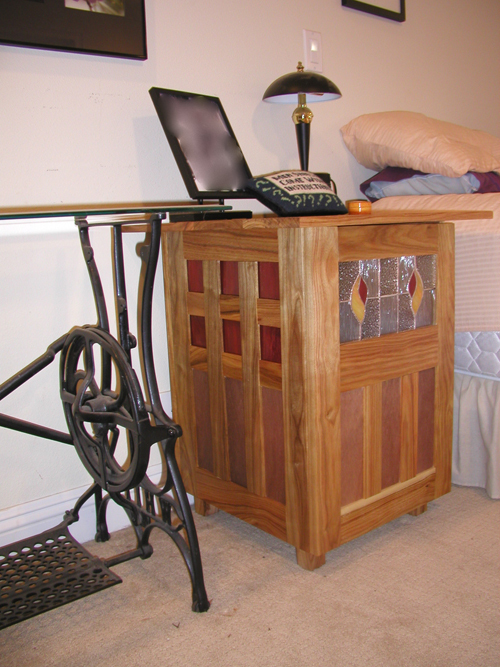 They are made out of Canary wood, with Mahogany inserts in the panels, and hand made, custom designed stained glass. I lost these in the divorce, but I have the plans, and as soon as you send me that Felder Table Saw, I’m going to make another set. That’s also red glass in the top 2 rows on the sides, and I installed lights inside, so they also serve as lighting in the bedroom. I can’t wait to get a new set made! Hopefully I can get that done sooner rather than later. This year I also finished a project that has been laying fallow for almost 8 years. I designed this, and all the pieces were cut, but it needed assembly and finishing. So I did. 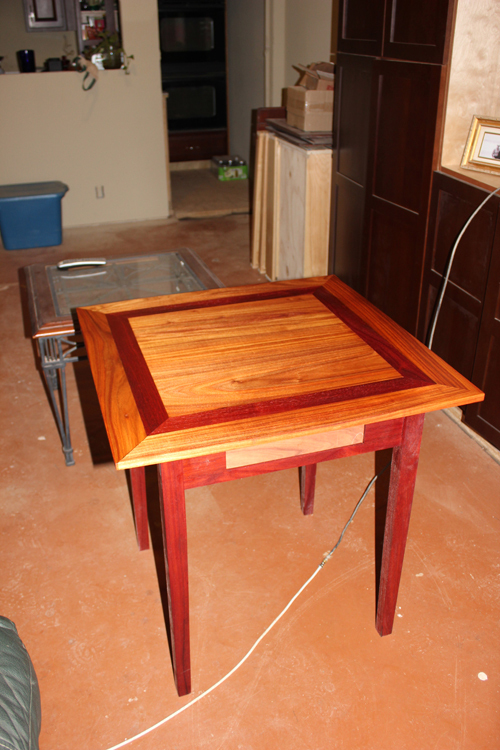 It’s a game table made of Padauk and Canary wood. The drawer slides back and forth through the table so you can access it from either side. I have since turned 2 Padauk knobs for the drawer, so it really is finished! 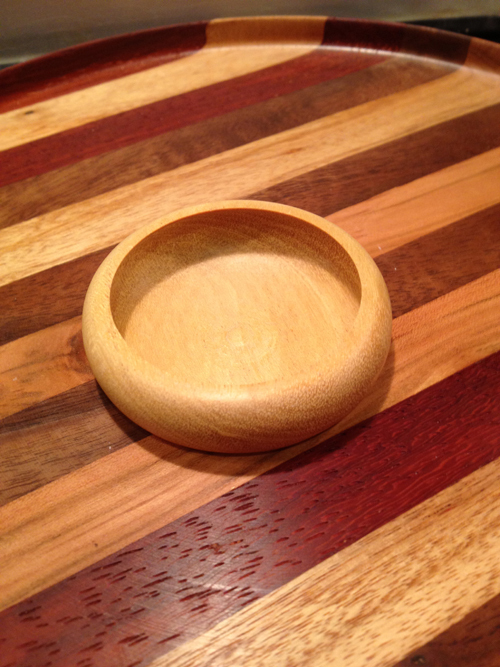 I have since turned my attention to the wood lathe — hence the turned knobs on the game table. And with great enthusiasm. I joined the TechShop RDU last year for 2 months, and took a wood lathe class, and was immediately hooked! So I saved my pennies and bought myself one. No, not a TechShop, but a lathe. It cost about what a 1 year membership would have cost, and I can use it any time I want! 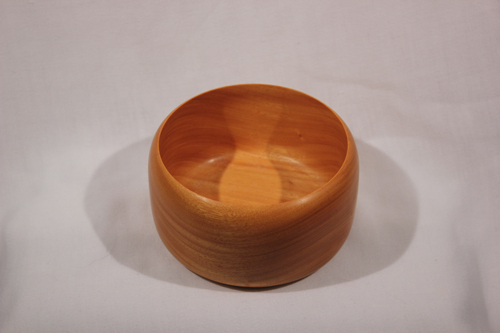 Here’s a small sampling of some of my turnings. And not a particularly representative sampling, either. Some of these were turned at the TechShop, and I’ve gotten much better. 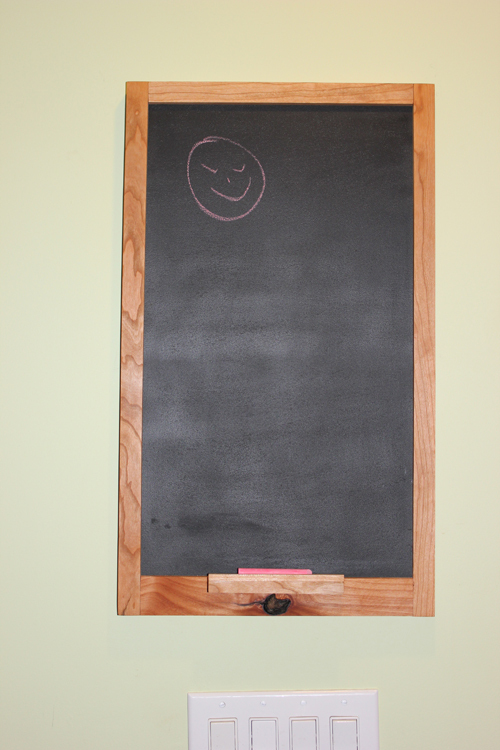 The last thing I completed (since it only took a few hours) is a natural cherry chalkboard. It’s amazing how good the new chalkboard paints are! The cherry for the above chalkboard is scraps from a larger piece I’m currently working on. No pictures, yet, but hopefully soon. 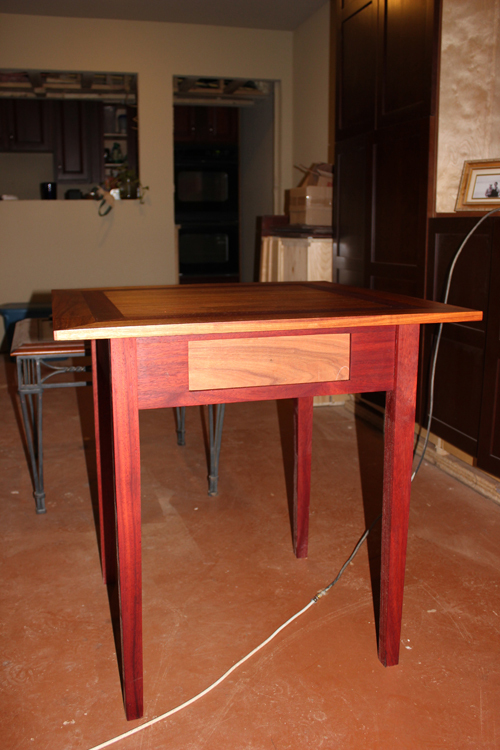 It’s a 4′ x 8′ (collapsible to 4′ x 4′) dining room table, Natural Cherry with Padauk and Walnut inlay. Next up after that is some experimentation with steam-bending wood so that I can make the required 8 dining room chairs for said table. Check back often for updates as I complete projects and start new ones!